As a bureau of the U.S. State Department comes under fire for paying hundreds of thousands of dollars for Facebook "likes," current and former employees have described the bureau as wasteful, unaccountable, and lacking a coherent mission. "Every government bureaucracy on the face of the Earth experiences turf wars, morale issues, infighting and red tape," the Cable reported on Sunday. 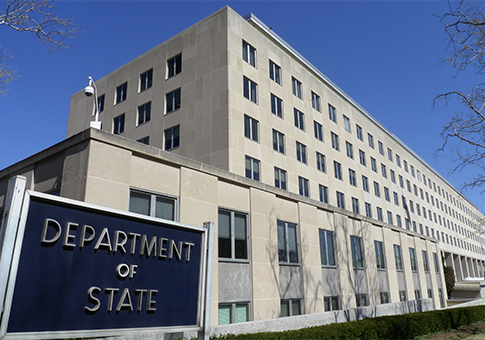 "Then there’s the State Department’s Bureau of International Information Programs (IIP)." The IIP says it "provides and supports the places, content, and infrastructure needed for sustained conversations with foreign audiences to build America's reputation abroad." The bureau was scrutinized last month after the State Department’s inspector general revealed that it had paid $630,000 for "likes" on its Facebook page. As the bureau searches for a new leader, officials interviewed by the Cable describe a dysfunctional office that has failed to establish a cogent role for itself, due in large measure to a lack of effective leadership. Others pointed to IIP's transient environment where many appeared to be playing musical chairs. "I can't tell you how many of my colleagues are either looking for jobs outside of IIP or actively applying for them," said a current IIP contractor. "The problem is no one wants to hire us at Main State because they don't respect us." This entry was posted in Politics and tagged Federal Bureaucracy, State Department. Bookmark the permalink.